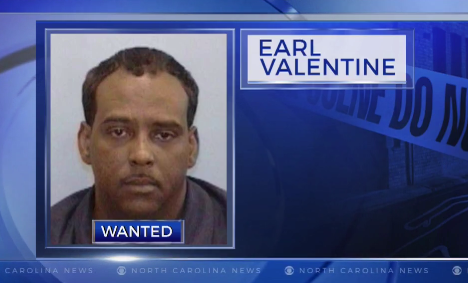 NORLINA, N.C. -- North Carolina authorities are searching for a man who they say shot and killed his 15-year-old son and later used Facebook to admit to shooting and critically wounding his ex-wife. Norlina Police Chief Taylor Bartholomew said Earl Valentine kicked in the door to his ex-wife’s Warren County home Tuesday and shot her before killing his son. The chief said he later talked to Valentine on the phone and described him as “cold and callous” and showing no remorse for the shootings. Bartholomew also confirmed that Valentine posted a video on his Facebook page admitting to his ex-wife’s shooting. The post has since been removed. The chief said a domestic protection order was in place but expired last month. “I’ve been in law enforcement 20 years and I’ve never seen anything like this this guy is bragging about it on social media. No remorse whatsoever. When we spoke to him on the phone he told us he is basically armed and dangerous,”said Bartholomew, according to CBS affiliate WNCN. Bartholomew also said Valentine indicated that he was on his way to Richmond, Virginia, to kill other family members. He said the FBI Fugitive Task Force and U.S. Marshals are involved in the case. He said Valentine should be considered armed and dangerous. Bartholomew said he has been in contact with Valentine by phone, but his phone has now been turned off, WNCN reported. At the time of the phone calls, police say the suspect was believed to be in the Richmond area. Valentine is facing a first-degree murder charge in his son’s death. Norlina is about 60 miles northeast of Raleigh and approximately 15 miles south of the Virginia state line.